The present invention is related to Web Services and is more particularly related to providing efficient client access to Web Services for pervasive devices. With the growing popularity of pervasive devices and the increasing bandwidth of wireless communications, users want to have access to more services at their finger tips while traveling without a PC. For example, a mobile salesperson may need services such as company inventory lookup, customer order status check, customer address lookup, etc. A Web service is a software system identified by a URI, whose public interfaces and bindings are defined and described using XML. Its definition can be discovered by other software systems. These systems may then interact with the Web service in a manner prescribed by its definition, using XML based messages conveyed by Internet protocols. 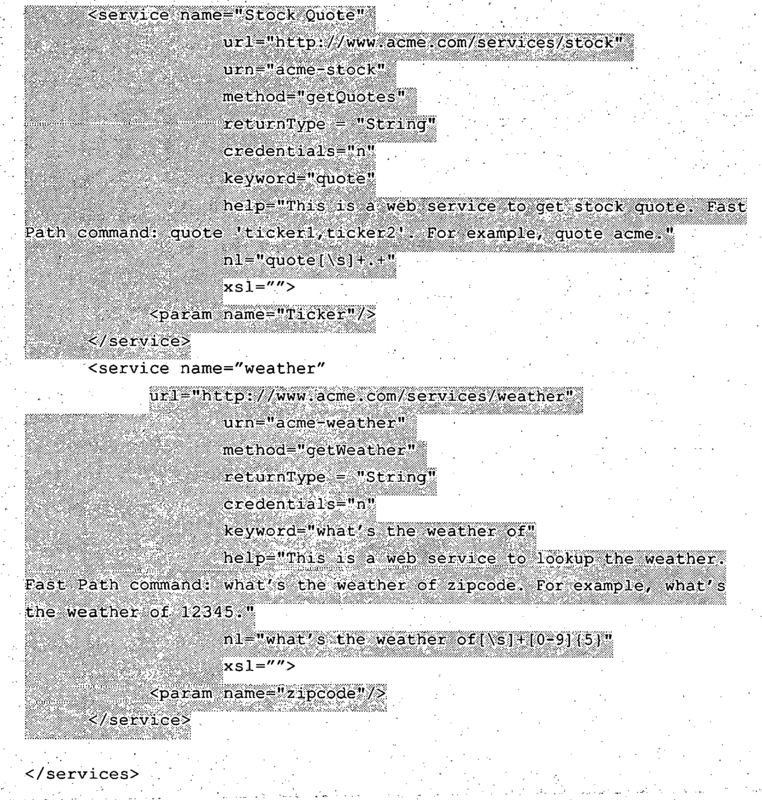 Traditionally, developers had to write a program to enable the access to a web service. For non-developers, it's very difficult for them to find a program for each web service that they need to access. Also, writing a program for each web service results in substantial cost in developing and support. US Patent Application Pub. No. 2004/0176958A1 , "SYSTEM AND METHOD FOR MULTIMODAL SHORT-CUTS TO DIGITAL SERVICES" filed February 4, 2002, describes a method and system for facilitating user access to services through a wireless device of a user, involves recommending to a user a subset of services from a plurality of services available to the user in which each recommended service of the subset has at least one voice short-cut associated therewith, and selecting a service to be accessed through the user's wireless device from the subset of services according to a voice command by the user corresponding to the voice short-cut of the service. US Patent Application Pub. No. 2004/0139151A1 , "APPARATUS AND METHOD FOR SELECTING A WEB SERVICE IN RESPONSE TO A REQUEST FROM A CLIENT DEVICE" filed December 17, 2002, incorporated herein by reference, describes An filed December 17, 2002, describes An apparatus and method for selecting a web service in response to a request from a client device. With the apparatus and method , when a request is received from a client device for the invocation of a Web Services operation, the request is received in an off-ramp device coupled to an on-ramp device that provides an interface to Web Services. The off-ramp device verifies that the requested service is in a configuration file and then determines the selection scope of the desired service, as defined in the configuration file. Based on the selection scope of the desired service, the off-ramp can determine whether to perform discovery and selection of a service implementation ("request" selection scope), retrieve a service implementation from a session level cache ("session" selection scope), or retrieve a service implementation from an application level cache ("application" selection scope). If a service implementation corresponding to the requested service does not exist in the session or application level cache, the discovery and selection operations may be performed to identify a service implementation to handle the request and the service implementation may be stored in the appropriate cache. US Patent Application Pub. No. 2004/0030740A1 "METHOD AND SYSTEM FOR AUTOMATING GENERATION OF WEB SERVICES FROM EXISTING SERVICE COMPONENTS" filed August 9, 2002, describes a computer-based method for generating a Web service. The method includes identifying first and second service components for inclusion in the Web service, which includes locating available services using service detectors that use differing search techniques and displaying the located services to the user to allow the user to make a selection to identify the first and second service components. The method continues with generating a description or contract for the Web service defining service behavior including invoking rules. A transport structure is then created for accessing the new Web service such as a transmission envelope. The Web service is advertised as being available on the communications network including registering the Web service with a services registry linked to the communications network. US Patent Application Pub. No. 2003/0088421A1 "UNIVERSAL IP-BASED AND SCALABLE ARCHITECTURES ACROSS CONVERSATIONAL APPLICATIONS USING WEB SERVICES FOR SPEECH AND AUDIO PROCESSING RESOURCES" filed June 25, 2002, describes systems and methods for conversational computing and, in particular, systems and methods for building distributed conversational applications using a Web Services-based model wherein speech engines (e.g., speech recognition) and audio I/O systems are programmable services that can be asynchronously programmed by an application using a standard, extensible SERCP (speech engine remote control protocol), to thereby provide scalable and flexible IP-based architectures that enable deployment of the same application or application development environment across a wide range of voice processing platforms and networks/gateways (e.g., PSTN (public switched telephone network), Wireless, Internet, and VoIP (voice over IP)). Systems and methods are further provided for dynamically allocating, assigning, configuring and controlling speech resources such as speech engines, speech pre/post processing systems, audio subsystems, and exchanges between speech engines using SERCP in a web service-based framework. US Patent Application Pub. No. 2004/0030627A1 "WEB SERVICES BROKER" filed April 18, 2003, describes a web service broker method comprising providing an interface between an enterprise and at least one of a service client and a service provider, the service client discovering Web Services on a service registry and using corresponding Web Services from the service provider, communicating between the enterprise and the at least one of the service client and the service provider and performing at least one of a) converting information from/to the enterprise to a form appropriate for the at least one of the service client and the service provider and b) converting information from/to the at least one of the service client and the service provider to a form appropriate for the enterprise. US Patent Application Pub. No. 2002/0174117A1 "MOBILE WEB SERVICES" filed May 15, 2001, describes a method to enable a mobile phone or wireless PDA to discover Internet businesses and services by accessing the Universal Description, Discovery and Integration (UDDI) registry. The method facilitates the formation of a query to the UDDI registry for the wireless device user. The method constructs a personal user profile of the user's UDDI searching strategies and Internet accessing preferences. The user profile can be used as a shortcut for online or offline queries to the UDDI registry or for accessing pages from web sites, in response to the user's entry of abbreviated inputs to the wireless device. The method is embodied as programmed instructions which may be executed within the user's wireless device to query the UDDI registry. Alternately, method is embodied as programmed instructions which may be executed within a separate knowledge engine server to query the UDDI registry in response to commands from the user's wireless device. The server can be used to cache files accessed from web sites, for selective forwarding to the user's wireless device. Browsers do not provide a means to access Web Services directly. Customized Web pages and programs have to be developed for each web service to be accessed. This results in substantial cost in developing and support. Furthermore, using a browser to access Web Services from web pages involves extra network RTT (round trip time) as the customized web page and programs must be downloaded before the browser is capable of accessing the Web Service. With the communication bandwidth limitation on pervasive devices, extra RTT has undesirable impact on the performance of the system. Another approach is to make a customized client application that talks to the service for each web service. The disadvantage of this approach is that eventually the number of applications will outgrow the memory/storage limit of the device as the services increase. The total cost to develop, support and purchase each application is substantial. Examples of conventional systems for providing internet connectivity to pervasive devices are described in EP 0 779 759 , WO 02/23857 and US 2003/0054810 . It is therefore, an object of the present invention to provide a dynamic extensible multimodal lightweight client solution to the Web Services so that the user can access multiple Web Services while requiring only a single application installation. By Multimodal we mean the user can use either text or voice as input. By Dynamic we mean the client will dynamically generate the GUI (graphical user interface) based on the attributes of the Web Services; it also means as the web service evolves, the client GUI will adapt to the changes dynamically without client code updates. By Extensible we mean mew Web Services will automatically show up on the client's screen as they become available, without any manual client change. It is a further object of the invention to authorize the client permission to access the first web service. It is another object of the invention to support client requests consisting of any one of voice, natural language text, digital data or Fast Path text. It is another of the invention to support attributes taken from the list of name of the first web service, description of the first web service, security requirement of the first web service, one or more keywords of the first web service, client name of the input field, client type of the input field, client default value of the input field and client flag to indicate if the field should be displayed. It is another object of the invention to save a predefined number of client inputs received from the first client and provide predetermined portions of saved client inputs to the client. It is another object of the invention to receive client input from the client, automatically transform the client input to a Fast Path form, the Fast Path form configured according to the stored attributes of a registered web service, and provide the Fast Path form of the client input to the client. It is a further object of the invention to provide a way for multiple Web Services to be disovered and executed in multimodal mode (voice and/or text) from a single application on pervasive devices. If is a further object of the invention to provide an automated "Fast Path" (semi-naturel language) access to the web services from a mobile device. The present envention recognizes that portable hand held devices (PDAs) could take advantage of a vast variety offered by Web Services if there were a way to register a subset group of Web Services of interest to the user of the PDA. Furthermore, it would be advantageous to relieve the PDA from burdensome communications overhead and complex resident applications in order to have access to Web Services. The present invention provides a method and process to quickly enable dynamic extensible lightweight access to Web Services on pervasive devices. The invention preferably comprises a server Generic Mobile Web Services (GMWS) Manager application running at a server. The GMWS Manager provides an interface between mobile devices and Web Services. The interface with the Web Services is preferably WSDL (Web Service Design Language). Furthermore, the GMWS Manager maintains a Web Service Registry (WSR) which holds information about each web service that the GMWS Manager has access to on behalf of the mobile devices. The Web Service Registry preferably contains or has access to metadata that is used to provide the interfaces to both the Web Services and the Mobile Devices. Preferably, the GMWS Manager is able to communicate with the Mobile devices in a variety of ways. The GMWS manager has access to a transcriber that transcribes voice, digital data, natural language and text to create Fast Path formatted structures to quickly access a particular web service. The mobile device preferably permits users to directly enter Fast Path formatted structures, bypassing the overhead of the transcriber function. According to the invention, a registered indication of one or more selected Web Services is stored in a local registry of the GMWS manager, the registered indication identifying the one or more selected Web Services. Furthermore, attributes of corresponding registered one or more selected Web Services are stored. Client requests are transformed to a form required by a first web service of the one or more selected Web Services based on the stored attributes. Client requests are forwarded to the first web service. Furthermore, according to the invention, web service responses are transformed from the first web service based on the stored attributes to a form required by the client. Transformed web service responses are forwarded to the client. A GUI representation of the registered one or more selected Web Services is presented to the client. In accordance with the present invention, there is provided a method as set out in claims 1 to 7, a computer program product as set out in claim 8, and a system as set out in claim 9. Additional features and advantages are realized through the techniques of the present invention. Other embodiments and aspects of the invention are described in detail herein and are considered a part of the invention. For a better understanding of the invention with advantages and features, refer to the description and to the drawings. FIG. 13 is a PDA portrayed in a subsequent view. Due to the steady advances in technology, mobile computers are now available as palm-top or hand-held devices, such as personal digital assistants (PDAs), in-vehicle devices, business organizers, and the like. In addition, many people now utilize cellular telephones to access the Internet and to perform various other computing functions. Portable computing devices including, but not limited to, palm-tops, PDAs, and cellular telephones are often collectively referred to as "pervasive" or "mobile" computing devices. Still referring to FIG. 2, the networks may also include mainframe computers or servers, such as a gateway computer (client server 206) or application server (remote server 208 which may access a data repository) . A gateway computer 206 serves as a point of entry into each network 207. A gateway is needed when connecting one networking protocol to another. The gateway 206 may be preferably coupled to another network (the Internet 207 for example) by means of a communications link. The gateway 206 may also be directly coupled to one or more workstations 101 using a communications link. The gateway computer may be implemented utilizing an IBM eServer zSeries® 900 Server available from IBM Corp. Software programming code which embodies the present invention is typically accessed by the processor 106 of the system 101 from long-term storage media 107, such as a CD-ROM drive or hard drive. The software programming code may be embodied on any of a variety of known media for use with a data processing system, such as a diskette, hard drive, or CD-ROM. The code may be distributed on such media, or may be distributed to users from the memory or storage of one computer system over a network to other computer systems for use by users of such other systems. In a preferred embodiment, the present invention is implemented as one or more computer software programs 111. The implementation of the software of the present invention may operate on a user's workstation, as one or more modules or applications 111 (also referred to as code subroutines, or "objects" in object-oriented programming) which are invoked upon request. Alternatively, the software may operate on a server in a network, or in any device capable of executing the program code implementing the present invention. The logic implementing this invention may be integrated within the code of an application program, or it may be implemented as one or more separate utility modules which are invoked by that application, without deviating from the inventive concepts disclosed herein. The application 111 may be executing in a Web environment, where a Web server provides services in response to requests from a client connected through the Internet. In another embodiment, the application may be executing in a corporate intranet or extranet, or in any other network environment. Configurations for the environment include a client/server network, Peer-to-Peer networks (wherein clients interact directly by performing both client and server function) as well as a multi-tier environment. These environments and configurations are well known in the art. The present invention provides Web Services by way of a server application to a mobile client device. The server application interprets keywords from the client device to a form compatible with a desired web service. Thus the client device requires minimal software knowledge of the web service as the server application manages the interfaces. Preferably, the server application has a list (registry) of supported Web Services and is able to provide the list to the client device. In a preferred embodiment, various forms of communications from the client device are supported. For example text or audio voice are supported whereby the server application provides a translator for translating voice into text or text into voice. Referring now to FIG. 3, the present invention is implemented on a Client Device 310 (Preferably a mobile handheld computer or PDA for example) in communication with a Generic Mobile Web Services (GMWS) Manager 320. The GMWS Manager 320 has network access to Web Services 330 and a UDDI Registry 340. Preferably networks comprise the Internet. The communication protocol between 310 and 320, 320 and 330 are SOAP 301. Client Device 310 preferably employs an operating system such as MICROSOFT WINDOWS™, MICROSOFT WINDOWS CE, PALM OS™, and BLACKBERRY™. Generic Mobile Web Services (GMWS) Client 311 (referred to as the client herein) resides in Client Device 310. It gets the Web Services metadata from GMWS Manager 320 and generates user interface for the user on the Client Device 310. It also sends the web service request to GMWS Manager 320. The GMWS client 311 is preferably implemented in JAVA™ programming language as a standalone application installed on the device, which should provide a JVM™ (Java Virtual Machine). GMWS Manager 320 includes four components: a Voice Transcription Service 321, a Fast Path Parsing Service 322, a Web Service Dispatcher 323 and a Web Service Registry 324. Generic Mobile Web Services (GMWS) Manager is preferably implemented in JAVA programming language running as a server application in an Application Server, such as IBM WEBSPHERE™. Fast Path Parsing Service 322 is used for parsing and converting Fast Path commands received from a client 311 into XML format. A Fast Path command is a semi-natural language sentence. It has keyword(s) and several input attributes for a web service. The multi-word attribute should be enclosed in quotes. The keywords and or command format is known to the GMWS Manager's Fast Path Parsing service 322. In one embodiment user of a GMWS client 311 wishes to send a request to a search web service to search ACME Company's help desk number. The user can use the following Fast Path command: search "what is acme help desk telephone number?" 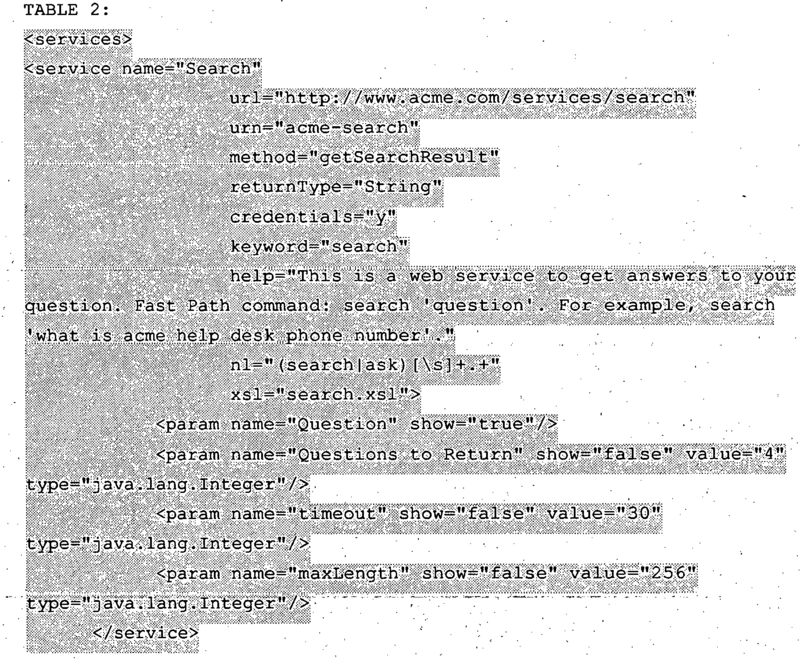 Here "search" is the keyword for the search web service, and "what is acme help desk telephone number?" is the single attribute for the search web service. check order status "ACME" "order 123456"
Here "check order status" is the keyword for customer order status check web service, and "ACME" and "order 123456" are the two attributes for the customer order status check web service. In one embodiment, the GMWS manager 320 accepts audio input. Here, a Voice Transcription Service 321 is used for transcribing a voice input to text. Voice Transcription Services are exemplified in U.S. Patent Application Serial No. 10/979, 334 "Method, System of Enabling Intelligent and Lightweight Speech to Text TRANSCRIPTION Through Distributed Environment" assigned to IBM, filed November 2, 2004. In the embodiment, the user provides the Web Services request by speaking the Fast Path command into a microphone of the client device 310. The audio is sent from the Client Device 310 to the voice transcription service 321. Preferably the text transcription service 321 returns the text version of the voice request to the user's Client Device 310 to confirm accuracy so that the user can modify it if the transcription is not accurate (100% accurate). In an implementation, the GMWS Manager provides prompts or clues to the Client 311 when the received text appears to have syntax errors, incomplete statements or the like. The items 1 to 8 can also be obtained from a UDDI Registry 340 if the web service 331-334 has a Universal Description Discovery Interface (UDDI) entry. The WSR 324 will get information such as the request/response message format, service address etc. from the UDDI entry. The template for Fast Path Parsing can be implemented as a regular expression. Web Services Dispatcher (WSD) 323 gets the web service request from the client 311. A request is sent from the client 311 in either xml format or Fast Path format. If the text is in Fast Path format, the text will be sent to Fast Path Parsing Service 322 to get parsed and converted to XML format. Web Services Dispatcher 323 is also responsible for invoking the web service 331-334 after receiving the request from the client. A preprocess may be applied to add in any hidden input fields before invoking the Web Services 330. After a response is received from the web service 331-334, the response may be transformed by the Web Services Dispatcher 323 to a form acceptable by the client 311 and then transferred back to the client 311. Referring to FIG. 4, an embodiment of a Client 311 logging into the GMWS services is shown. The user starts the GMWS client application 401 at his Client Device 310. The user provides his credentials (ID and Password) 402. (The credentials might be saved at the Client 311 such that they are automatically provided by the client software 311. The client 311 requests 404 a list of Web Services from the GMWS Manager 320 with user predefined profile. The client 311 receives a list of Web Services and metadata 405 from the GMWS Manager 320. The metadata received 405 is used by the client 311 to formulate communications to and from the GMWS Manager and to provide GUI structure. Preferably, a user can elect one of many 406 communications means to access a web service. For example, Voice, Fast Path (predetermined syntax rule text), natural language or by selecting a specific web service. Referring to FIG. 5, the user may elect any of Voice input 501, Fast Path input 503 or a specific web service 506 for communications with the GMWS Manager 320. In the case of Voice input 501, the client calls 502 the Voice Transcription component and optionally receives the text version of his voice call. (Optionally, the user may receive a voice version of the text response). The user checks the response as Fast Path syntax 504. Optionally the user can make adjustments to his original syntax in light of the response text 502. The client 311 calls the WSD for Fast Path input 505. Finally, the client receives the response and generates a GUI display 510. Optionally the user may have elected to provide Fast Path input 503, in which case his input is directed to WSD 505 to initiate the Web Service transaction. Finally, the client receives the response and generates a GUI display 510. Optionally the user elects to select 506 a specific web service. The system generates 507 the input interface for that web service. The user provides 508 input which the client 311 uses to generate 509 XML input and calls WSD for XML input. Finally, the client receives the response and generates a GUI display 510. Three flow examples will now teach elements of the present invention. Two versions of Fast Path access are shown, the first demonstrating an example of a Voice initiated transaction, the next demonstrating a Text initiated transaction. A third version demonstrates a GUI driven transaction. It should be noted that for the Fast Path transactions, the Fast Path language from the client determines not only the elements of the transaction but also which web service is being accessed. The GUI driven transaction provides a GUI assist at the client tailored to a specific web service. Web Services 330 are selected for incorporation in the Web Services Registry 324 via WSDL. Many methods might be employed to populate the Web Services Registry. More than one Web Services Registry might be employed. In one embodiment, a group of subscribers share a Web Services Registry. In another embodiment, permission for individual Web Services of the Registry or permission to access one of a plurality of registries is defined at Login time 601 - 602. In another embodiment, a client negotiates for permission to access a web service of the list of Web Services when it initiates its first use of the web service. Preferably, each example transaction begins with the client being authenticated for the GMWS Manager 320. Referring to FIG. 6, the client sends 601 its login request along with credentials to GMWS Manager 320, which in turn invokes 610 the Authentication Web Service; the Authentication Web Service verifies 618 user's credential and returns 611 the status back to GMWS Manager 320. The client receives 602 the authentication status and if the authentication is successful, the client continues by sending 603 a request to the Web Service Dispatcher 323 for a Web Services list. The request 603 includes a personalized profile managed on the client. The personalized profile may in one embodiment be used by the GMWS Manager to determine which Web Services of the Registry 324 are authorized for the client to use. The list and metadata is retrieved from the Web Services Registry 612 and returned 604 to the client. The metadata supports the client 311 use of the Web Services on the list. If the client 311 elects to transmit an Audio (Voice) request 605, the audio request is transcribed 613 by the Voice Transcription Service 321 into text. The text (or optionally a voice simulation of the text) is returned 606 to the client 311 so the user can verify that the audio was translated correctly before proceeding. If there is an error, the text is corrected and sent 607 back to the GMWS Manager 320 as Fast Path syntax. The Fast Path parsing service 322 locates the target web service 330 from the WS Registry 324 and causes the WS Dispatcher 323 to dispatch 615 the request to the target Web Service (Search service in the example). The Search Web Service processes 619 the request and sends a response 616 to the GMWS manager 320 which formats the response if needed 617 and returns 608 a result to the client 311 which formats and presents 609 the result at the client device 310. Referring to FIG. 7, the steps up to 604 of the Audio example are the same as shown in FIG. 6. However, the client 311 elects to transmit Fast Path text rather than Audio, the Fast Path text request 701 is transmitted to the GMWS Manager 320 where it is parsed 614 by the Fast Path Parsing Service 322 to locate the Web Service from the WS Registry 324. The WS dispatcher 323 dispatches 615 the request to the selected (Search) Web Service 330 using metadata associated with the web Service. As in the example of FIG. 6, the Search Web Service processes 619 the request and sends a response 616 to the GMWS manager 320 which formats the response if needed 617 and returns 608 a result to the client 311 which formats and presents 609 the result at the client device 310. Referring to FIG. 8, the steps up to 604 of the Audio example are the same as shown in FIG. 6. However, in this example, the user selects 801 one specific web service, such as the search web service, from the list. The client generates 802 the user interface of that search service based on the metadata dynamically. The user then fills the input values and sends 803 the service request to the Web Services Dispatcher 323. An example request as, putting "What is ACME help desk phone number?" in the generated question field on the interface. After getting the request, Web Services Dispatcher 323 dispatches the request 615 to the desired (Search) web service. The Search web service processes the search request 619, and sends 616 the results back to Web Services Dispatcher 323. Web Services Dispatcher 323 may format 617 the results if that's defined in the metadata for this web service. The results are then sent 608 back to the client 311. The client 311 further formats 609 the results and presents the results to the user. A user's view of an embodiment of the invention is shown beginning in FIG. 9. A Client Device 310 is shown as a PDA. The PDA 901 comprises a viewable area (screen) 902 and a keyboard 903. The screen displays widgets 904-908 for applications available to the user. The user selects the GMWS (Generic Mobile Web Services) client application 908 which causes the PDA 909 to display the splash screen 910 for the GMWS application. The PDA 911 then displays a pull down menu 912 including: Hide Menu, Login, Settings 913, About and Close options. The user selects the Settings 913 option. This results in FIG. 10, the PDA 1000 displaying a settings screen for logging onto the GMWS application. The user enters his ID and Password, the PDA 1001 now displays a pull down menu 1002 including Hide Menu, OK 1003, Cancel and Close options. The user selects OK 1003. Referring to FIG. 11 the PDA 1100 now displays a pull down menu 1102 including: Hide Menu, Login 1103, Settings, About, and close options. The user selects the Login 1103 option. Once logged in, the PDA 1101 now displays 1104 a services list retrieved from the WS Registry 324 using the associated metadata. The options include FastPath 1105 and Services 1106. The list of Services 1106 include Mail, People Finder, Search 1107, StockQuote and Weather web service options. The user selects Search 1107. Referring now to FIG. 12, the PDA 1200 now displays a prompt 1202 "Question" followed by the user's supplied input "what's acme helpdesk number?". The GMWS manager takes the web service request, processes it and sends the response 1204-1207 back to the user's PDA 1201 screen 1203. Referring to FIG. 13, finally the PDA 1300 displays recent search questions 1302 previously submitted by the user as context menus 1301. These are preferably stored at the PDA and are available at future sessions. xsl: template used to transform the output of the web service. Optional. show: flag to indicate if this parameter will be displayed on the client device. The flag is Optional. If it's not defined, the parameter will be shown to the client. value: default value to be displayed on the client device. The value is Optional. type: type of the input parameter. By default, it's "String". Enum: Comma separated enumeration values. 'what is acme help desk phone number'." Path command: quote 'ticker1,ticker2'. For example, quote acme." The flow diagrams depicted herein are just examples. There may be many variations to these diagrams or the steps (or operations) described therein. For instance, the steps may be performed in a differing order, or steps may be added, deleted or modified. All of these variations are considered a part of the claimed invention. While a preferred embodiment of the invention has been illustrated and described herein, it is to be understood that the invention is not limited to the precise construction herein disclosed, and the right is "reserved" to all changes and modifications coming within the scope of the invention as defined in the appended claims. where the client request is a fast path text request, parsing the fast path text request via a fast path parsing service (322) of the mobile web services manager to translate the client request into extensible markup language format, and where the client request is a voice request, converting the voice request into a fast path text request via a voice transcription service (321) of the mobile web services manager and thereafter performing the parsing of the converted request. forwarding the transformed first web service response to the client. The method according to claim 1 comprising the further step of sending a list of registered web services of the one or more selected web services and corresponding attributes to the client. The method according to claim 3 comprising the further step of presenting a representation of the list of registered web services at the client. authorizing subsequent client access to the first web services using the saved indication of the client authorization. The method according to claim 1 wherein the attributes consist of one or more attributes taken from the list of a name of the web service, a category of the web service, an endpoint of the web service, an operation of the web service, a template for fast path command parsing, a description of the web service, a security requirement of the web service, one or more keywords of the web service, a client name of the input field, a client type of the input field, a client default value of the input field and a client flag to indicate the field should be displayed. responsive to client requests, providing stored client attributes to the client. a storage medium readable by the mobile web services manager and storing instructions which, when executed by the mobile web services manager adapt the mobile web services manger to perform the method as claimed in any preceding claim. a mobile web services manager computer system in communication with the one or more web service computer systems by way of a network of the one or more networks, the mobile web services manager computer system further in network communication with the one or more mobile client computer systems, wherein a mobile web services manager of the mobile web services manager computer system includes instructions which, when executed by the mobile web services manager, adapt the mobile web services manager to perform the method as claimed in any of claims 1 to 8.